The future vision in Barricade shows a world torn apart by a war fought against humanity and their own artificially created super-humans, known as "Ficials". In the UK (seemingly along with the rest of the World) the results are pretty catastrophic. As you can probably imagine once humanity has created these superior beings the've looked at the world and the human race and realised that the only way to prevent the complete destruction of the Earth would be to get rid of the plague of people that populate the Planet. Many people object to this mass "culling" and decide they'd rather fight instead. As a result, most of Britian is a wasteland and the Ficials control the crumbling big cities, Barricaded against the "Reals" - human survivors who live in tribes in the wastland between cities. Kenstibec is one such Ficial, originally engineered to help build a new world but now a taxi driver in whats left of the old. We join Kenstibec as he is tasked with delivering a fellow Ficial (one of the "pleasure models") from Scotland to London. A challenging journey by car at the best of times, not to mention after roads are in ruins and the path is largely populated by 10 foot long rats and savage Reals. I love the way this book has been constructed. Rather than take the obvious route of showing how humans struggle against this stronger, faster and less emotional race we are treated to viewing the book from the perspective of those super-humans. This first person perspective from the anti-hero role is refreshing, contemplative and a great deal of fun. Fun? actually yes. 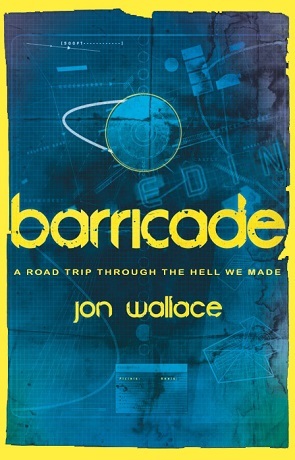 While suitably dark by its very nature and not hiding the brutality of a post-apocalyptic Britian, Barricade never takes itself too seriously and throughout the novel there is an air of dark comedy about it. I loved this feeling the author imparts and it means reading the book a breeze. When you tie in a fast pace, flawed characters and a quality to the prose you end up with a book that you can fly through without pause for breath. Action is frequent, frantic and well choreographed - always kept along the edge of realism rather than gung-ho heroics. There are messages to be gained too, like Pratchett though the author is saying these through the medium of comedy and calamity rather than mortality and morbidity. This perspective works fantastically well, the cold, clinical, emotionless viewpoint a stark contrast to the highly emotional and often disturbed "Reals". It helps to show how much we rely on our socially defined definitions for everything we do. More importantly it questions what we perceive as "normal" - both emotionally and physically - and how we react when presented with something that is abberant to our socially constructed definition of the same. Barricade is like one of those clever teachers that manages to educate through fun and amusement. More than that though its a book that can be enjoyed on many levels. You can just enjoy the ride; the crazily constructed story and crafty characters or you can enjoy the messages it subtly imparts. Either way its a darkly funny journey and one not to be missed. Written on 23rd June 2014 by Ant.